While camping or hiking you will at some point need to build a fire, cook your meal or boil your water. 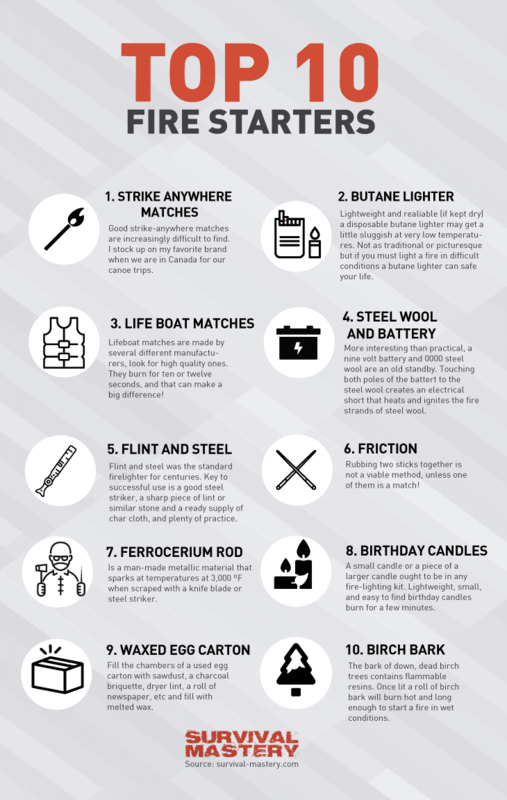 If your matches and lighter can’t help you (it’s rainy, foggy, too moist) you will have some trouble starting any fire at all. That’s why many people prefer to keep in their backpacks fire starters. They are light and help you start a fire in matter of seconds. Of course, having matches or a lighter would only be complementary to a fire starter. In this article we’ll review several popular and highly appreciated fire starters. We’ll share customers’ reviews and opinions and all the good and bad sides these products have. You’ll find it much easier to determine which fire starter is the best for you and your particular needs. 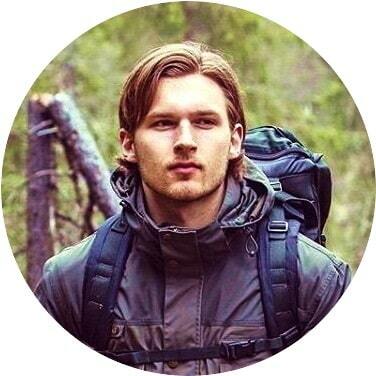 It all depends on whether you’re a casual hiker or camper, or you’re a real hard-core survivalist. This product is a smaller version of the popular UST BlastMatch. It can be used to make smaller fire and flames, but that doesn’t mean it’s less worth the price. In fact, the product comes with the WetFire tinder, which is useful if you expect wet rainy weather. You can use it with one hand (since the striker is inside), which is also a great feature. You only have to press the button, slide the rod away and position it close to the tinder. The sparks will jump right towards the tinder and you’ll have flames in a second. If you run out of tinder, you can order more in a separate package of 8 pieces. According to customers’ tests, one UST tinder piece can burn for up to 10 minutes and can produce flames as high as one foot. For the price, this is a great product and most customers like how easy this fire starter is to use. Some people compared it with other fire starters and they are pleased with how easy UST is to start a fire. These two are sturdy and reliable products by the popular and trusted among customers Light My Fire. 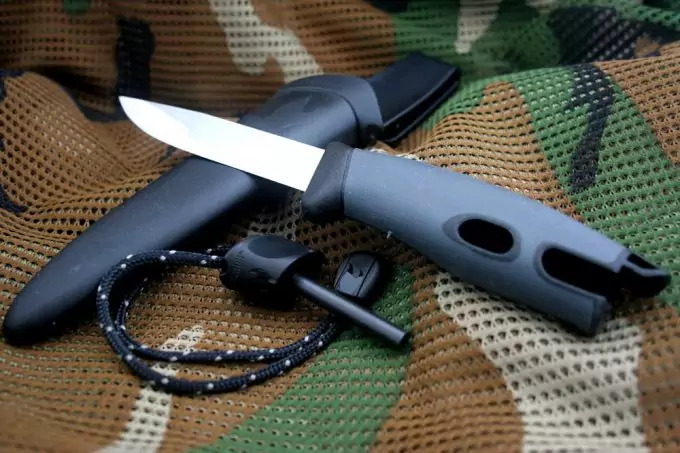 The knife has a spark rod at the handle (the blade itself is made of stainless steel). The reason why this combination is so good is that the tinder on a rod is made of fatwood and catches fire pretty quickly. It’s waterproof and is attached to a lanyard. The tinder is 80% made of resin and it’s actually the resin that burns (the wood is just the basis for the resin). As for the fire starter, it has a pretty long life of overall 3000 strikes. It can produce sparks even in cold weather, different altitudes and weather conditions. This product is a small version of similar products of the Bear Grills series. The handle is made of rubber and it easy to hold (doesn’t slip). 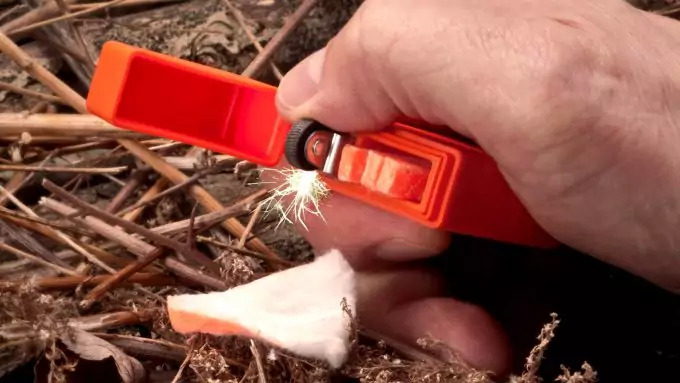 It’s a small and compact fire starter (weighs less than an ounce), but just as reliable. It comes with a lanyard, which you can have as a bracelet, attach to your zipper or backpack, etc. – all depending on your preferences. The cover is made of aluminum, which means the Ferro rod is protected in all weather conditions. 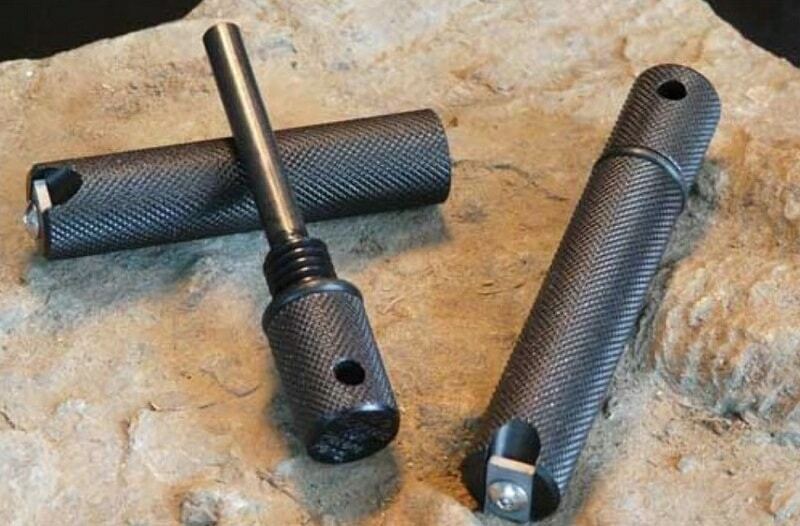 It also snaps very comfortably and secure to the fire starter, which means it won’t fall loose off the rod. The cap is also thick and durable, and provides for the water-resistance of the entire product. The fire starter comes with a Tungsten Carbide, which is also a nice surprise for customers. This product, according to some tests and customers’ experience, can produce very large sparks. Some people even claim they are larger than any other they saw produced by other fire starters. This means, you’ll have very high chances of starting a fire in a second. Most people report that the sparks are very hot and stay alive for longer than the customers expected. As long as you have nice dry tinder, you may not even need to get special fatwood or other such products. 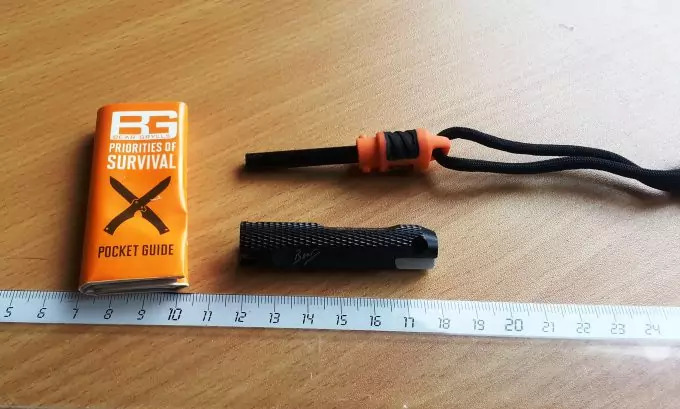 Also, the Exotac fire starter is very small and you better attach it to a necklace or bracelet lanyard, keychain, or otherwise you may easily lose it. Of course, it also comes with a protective cap of aluminum and magnesium. On it you can find the Tungsten Carbide for the strike. This NanoStriker has a life of about 3000 strikes (in comparison to 1000 for average fire starters). If you want to pair this fire starter with some manufactured tinder, you can again use Exotac’s tinderTIN. The only thing to consider well before purchasing this tinder product is that the tin is very small and some customers claim it’s better to buy tinder wood to shave off yourself, rather than use this one. The product works as expected, but the amount is too little and can be disappointing when you first open the lid. This is another great product in the fire starter category. Coghlan’s flint and fire starter has a longer life than the above – about 4000 strikes, which is impressive. You need to just push down the rod to start the sparks. It also works fine in different weather conditions and can still produce sparks in wet weather. And if you have water-resistant tinder, you will have no problem starting a fire. Most people report that in order to start the fire they do two strikes. That’s all it takes for flames to burst up. If you try to light some other material like pine needles, paper, etc. you may have to strike much more (up to 50 times), but it depends on the material. To keep the product usable for longer, just use fatwood or resin-coated tinder – they catch on fire immediately. The only downside, according to most customers, is that the striker isn’t as good as, for example Super Scraper. For some customers it takes several strikes to light a fire. If you match the Coghlan’s flint striker with a Super Scraper, you’ll have a great combination for a fire starter. Otherwise, using Coghlan’s product with their tinder, you can light a fire in two strikes. It depends on what’s your preferred combination. Another customer reported that sometimes Coghlan’s flint and fire starter can produce very long sparks and be sent to more than a few feet away. This Gerber’s product is a larger and more optimized version than the above listed. It’s probably a little more reliable since it has a few additional features. For one thing, it still has a Ferro rod and a metal striker, but in addition it sports a whistle. It’s nicely attached to a lanyard. The entire product is held onto the same lanyard so there’s no risk of losing any of the fire starter’s parts. On top of all that, you also get SOS and Air rescue printed instructions, all printed on the cap. Of course, the metal casing is water-proof so no water or moisture can penetrate the inside of the tool. When you first try to start a fire, you may have to strike several times, until you get to the metal, but that’s only for the first few uses. Later on, sparks will fly almost instantaneously. 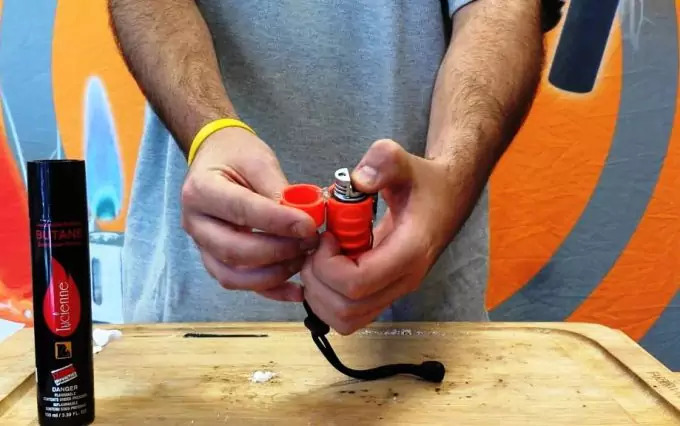 There is some space for a cotton ball or a little tinder to put in the cap, when you close the fire starter, which is a great way to make sure it won’t get wet and can be used if you’re in a critical situation. So, that’s a pretty handy trick to keep in mind. People also report that the fire starter produces really large sparks, so you’re sure to have some fire quickly. And finally, the lanyard may seem a bit too short for some people, so if you prefer wearing it on your neck, you can substitute with a customizable lanyard. Otherwise, the one that comes with this fire starter will do best to keep it close to you (as a bracelet, attached to a zipper, etc.). This one looks like an ordinary lighter, but it’s not. It is lighter than a normal Zippo lighter and you can produce sparkles with only one hand. There’s a spark wheel when you open the flip. When you rotate the wheel (just like a regular lighter) sparks come out. They are significantly smaller than those produced by most of the above products. Otherwise, this product comes with cotton and wax tinder (4 pieces). You can store up to 3 of these tinder balls in the case compartment. Most customers report that you need to strike at least 3 times to start some fire. 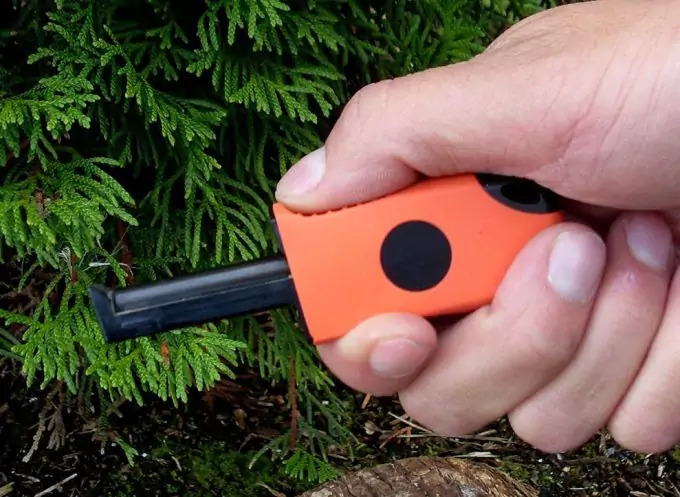 One of the problems with this fire starter though is that the o-ring, which keeps the product water-resistant, may not give the best results, and sometimes customers had to use some force to make sure the cap is locked tight. This may compromise the water-proof property. Of course, if you’ll be camping or hiking in a completely dry area, you shouldn’t have any of these concerns and you can enjoy the Zippo fire starter. This one is very small, and even if it comes in two sizes (5 and 8 cm), it’s still small. This is why it’s called emergency fire starter, since it can fit in small tins, compartments, bags, pockets, etc. You can keep it with you anywhere you go and be prepared for any emergency situation. If you have large hands though, this may not be a good idea for you. Some customers report that, due to the small size they believe they can burn themselves trying to start a fire. If the size isn’t a problem for you, then you’ll enjoy this product. As for the product, you can burn the entire container for about 30 minutes, with the lid completely removed. Otherwise, you can control the flame, by regulating the lid. You can slide it back and forward to make the flame larger or smaller. There is also a side lid, which when you slide it, can turn the fire starter into a candle. Also, don’t hold the fire starter in your hands while it’s burning, since the tin can become very hot. To use this product you will also need a rod, so you can start the fire yourself. Some people share that their Live Fire starter came with a ferro rod, others said they got only the flammable product. You may have to contact the manufacturer for specifics about what you get when you order one. This fire starter was initially designed for pilots and air force military. In situations when they crashed or were stranded (and maybe injured), they would be able to easily start a fire using just one hand. The sparks are a few times hotter than ordinary sparks or sparks from matches. It’s waterproof and can be used for thousands of strikes. It will work in any weather conditions. If you use this fire starter with cotton ball and vaseline you should be able to start a fire by striking only once. It works even under heavy rain, but you’ll need good flammables like resin or vaseline tinder. Also, you can rotate the bar, so that the inside tungsten carbide and flint don’t get worn off too quickly on one side only. The use will be evenly distributed if you do the rotating regularly. 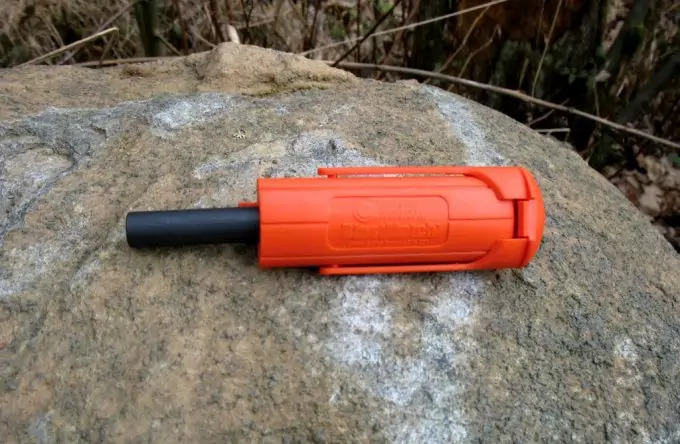 The fire starter has a waterproof casing, and it’s reliable enough. 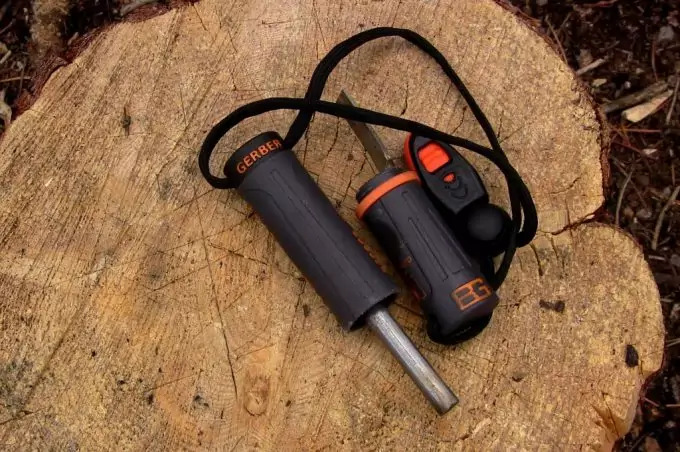 Some customers believe the product is made of cheap material and could be easily broken if dropped or handles inappropriately, but for the price and money you’re paying, you’ll get a pretty decent fire starter. If you handle it properly, it should last for years. This is again a product by UST, a well-trusted manufacturer. 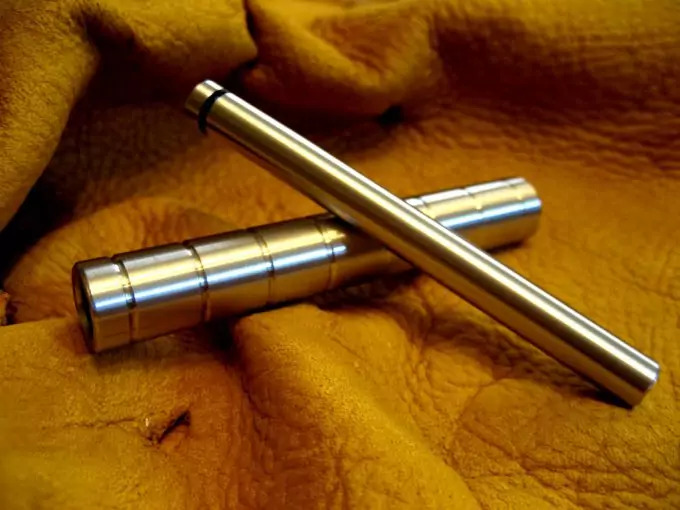 This lighter uses a Piezo-electric igniter, which means it can be used for over 30,000 times. The lighter also has tank that stores 4 grams of fuel and can be used for up to 1000 times before the next refill. As the name implies, it’s a stormproof lighter and can withstand winds of up to 80 m/h. There’s an o-ring seal, which makes the starter waterproof. The casing is made of rubber to ensure your grip is stable while you hold it. The only thing you need to consider before purchasing this product is that the fuel is butane. 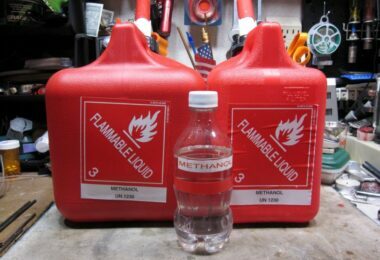 This means that, since butane doesn’t vaporize below 30 degrees F, you may not be able to start any fire (or even sparks) in cold weather. It’s true it withstands strong winds, but the low temperatures will keep the butane tan liquid and there will be no sparks. Also, some customers shared their experience on higher altitudes, where the starter didn’t work as well. Usually temperatures in higher altitudes are always lower than at sea level. Some users thought of keeping the lighter close to their body, so that it’s always in a warmer environment before you use it in colder conditions. This may be one of the solutions. Otherwise, if you’re planning on just casual sea level trip or at warmer conditions (not winter), this lighter won’t fail you. And after all, this is what the manufacturer advertised – a wind-proof lighter. When it comes to that, it works perfect. This product is designed and manufactured by Solo Scientific, USA. The striking blade is made of fully hardened steel. It’s very sturdy and strong in the touch, so it’s made to withstand heavy conditions. There’s no risk of breaking it, if you drop it. There’s a loop hole, which you can use to attach the fire starter to a lanyard or a keychain so it can always be close at hand. It fits perfectly a 550 Paracord through the hole. In addition, it’s waterproof (as long as you keep the cap on). Many people report though a slight flaw in the execution of this product and it’s the casing. 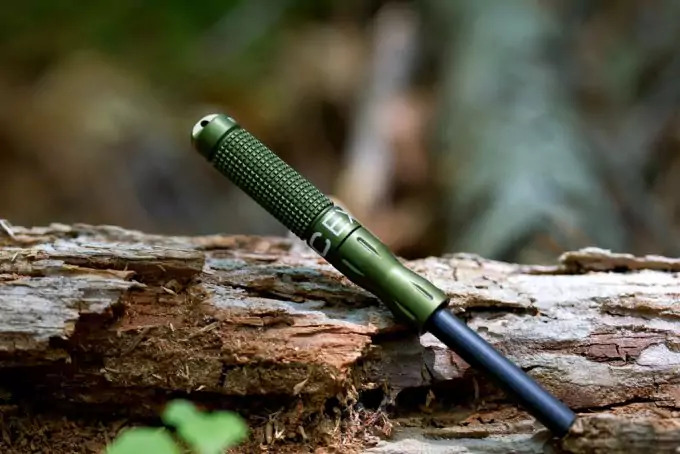 It’s made in a cross-hatching pattern, which could improve the grip, but some users explained that some of the sharp edges of the cross-hatch are actually cut-sharp and they had to file these edges a bit until there’s no risk of cutting your hand, pocket, etc. They believe the price is slightly higher for this product, but when it comes to it producing sparks and starting a fire, it won’t fail. Many people had used it for more than a few years and were pleased with how easy it is to use. The product contains a magnesium fire starter, flint and a striker tool, which together will produce the sparks you need for a fire. It’s waterproof and will work in any weather condition. It’s packed in a small and snug box, and the product itself is light and compact and can fit your pocket without a problem. It comes with a lifetime warranty. The reason why this product is so good is that it’s made of magnesium. It is highly flammable and even if it’s wet it produces sparks. It must be in a shaving form for it to start a fire. Also, you use the flint and striker, which produce eight time hotter sparks in comparison to matches. The edge of the file, which comes with this package, also has a saw on it. You can use it to shave off some tinder or wood scraps. Users are overall very satisfied with this product and most claim that however many times they tried it, the starter always worked and never failed them. One customer experimented by soaking the magnesium for 10 hours and when he took it out of the water and tried it, it immediately created sparks, with no drying or fuss. Since the price is affordable and low, the feeling is that you receive quality for the money you pay. Almost no customer was dissatisfied and all of them recommend this product. This one ships with a Ferro rod and a hacksaw carbon steel blade. It can be used for up to 10,000 strikes. The hacksaw blade can also be used as a cutting tool. The generated sparks are very hot and can reach up to 5500 degrees F. This means there will be no way you can’t start a fire in any weather condition – at sea level or high in the mountains; in a wet and moist conditions or hot and dry. There’s no material on this product that can be broken (like plastic parts), so the risk of failures is at a minimum. The size of the product can fit a pocket knife sheath or an antler. So, overall if you need a reliable fire starter and you’re not into any fancy tools, this product will meet your expectations. 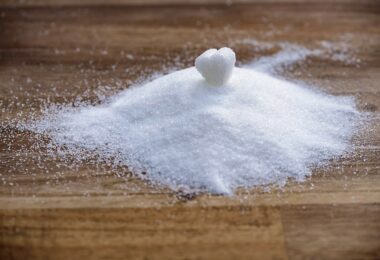 With all of the above items listed in this article, you’re highly advised to first try them at home and get used to them. Also, pick a few of them with different properties and feel so that you can better judge which of these would best suit your needs. You should also include a pack of waterproof matches in your kit, just to be sure. We have a set of reviews on the best waterproof matches you should check out. You may try the cheaper product before you can decide if a more expensive item would be best for you. 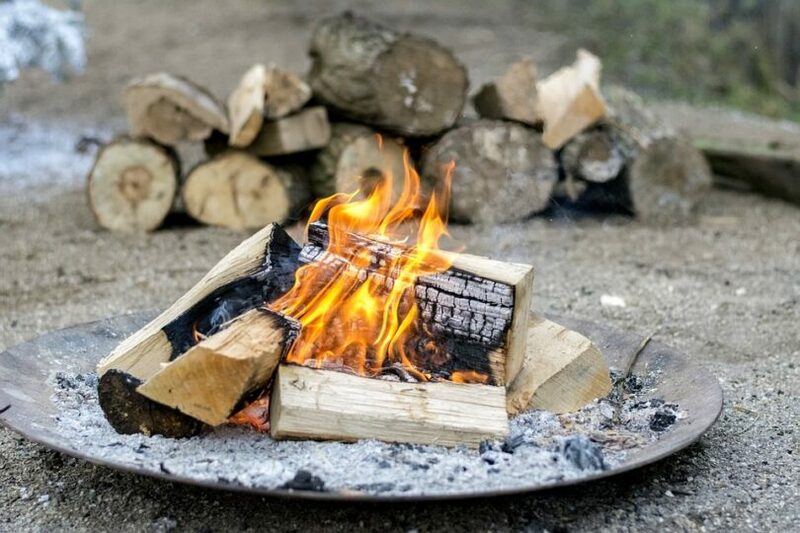 If you’re already experienced camper or survivalist, you probably know that having a backup item, like a second fire starter or lighter, is a must. For example, if you’ll be camping in cold weather, the Windmill’s fire starter isn’t for you, but if you’re going in a dry summer day, the same fire starter would need a spark to start a fire. So, planning where you’re going and what the weather will be, is best before committing to a purchase. And again, don’t buy a product, which you will use on the next day – try it before you go camping and make sure it works so you can rely on it.